Colonies of Dysaphis hirsutissima are attended by ants which tent the colony on the basal parts of Anthriscus sylvestris (cow parsley), sometimes completely covering it with soil particles (see first picture below). 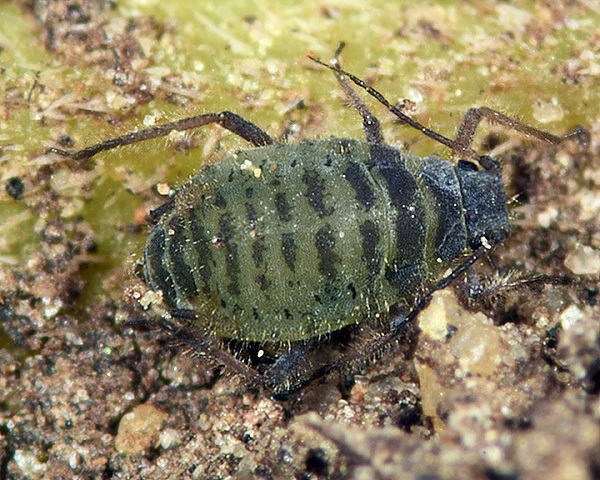 The adult apterae of Dysaphis hirsutissima are bluish-green with a dark dorsal pattern of paired sclerites and cross-bands (see second picture below). 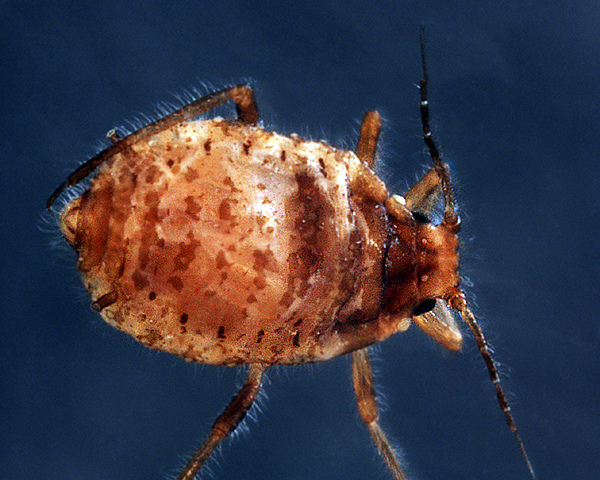 Dorsal hairs are long and very numerous on each tergite. The longest hairs on antennal segment III are 57-97 μm long, 2.5-3.7 times the basal diameter of that segment (cf. 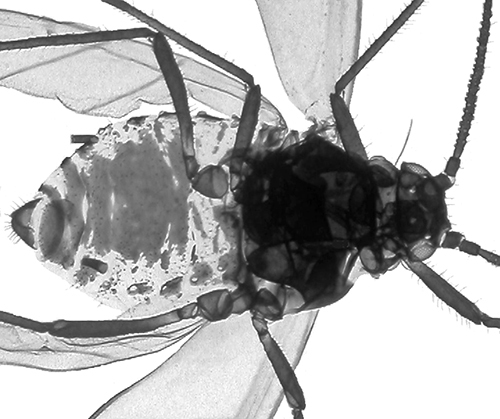 Dysaphis anthrisci which has longest hairs on antennal segment III at 26-72 μm and dorsal hairs less numerous and shorter). 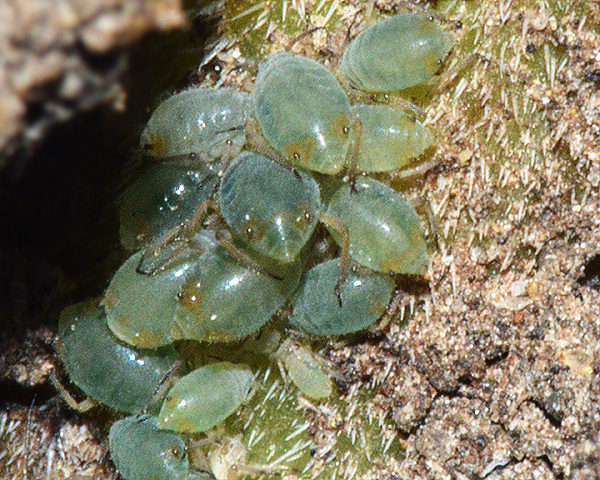 Immatures of Dysaphis hirsutissima (see third picture above) are also blue-green and are very hairy like the adult, but they lack the black markings. 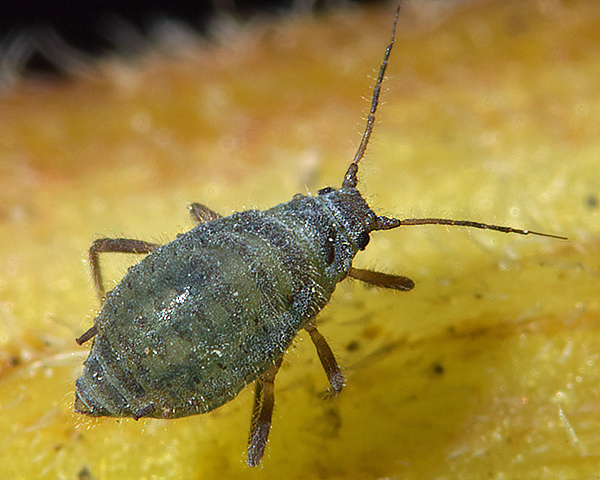 They also have an orange patch around each siphunculus as do immatures of several other Dysaphis species. The micrographs below show an adult Dysaphis hirsutissima (dorsal and ventral) preserved in ethanol. 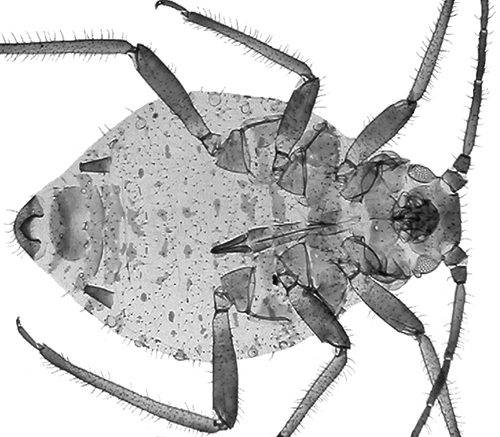 The clarified slide mounts below are of adult viviparous female Dysaphis hirsutisima : wingless, and winged. Dysaphis hirsutissima is found on the stem base and in leaf sheaths of cow parsley (Anthriscus sylvestris). It has only been recorded from Britain, Denmark, the Netherlands, Sweden, Switzerland and Italy, but is probably widespread over most of Europe. We have only found this species on one occasion on an isolated plant of cow parsley at Birling Gap on the East Sussex coast. The plant itself was nearly dead, although the stem was still green. 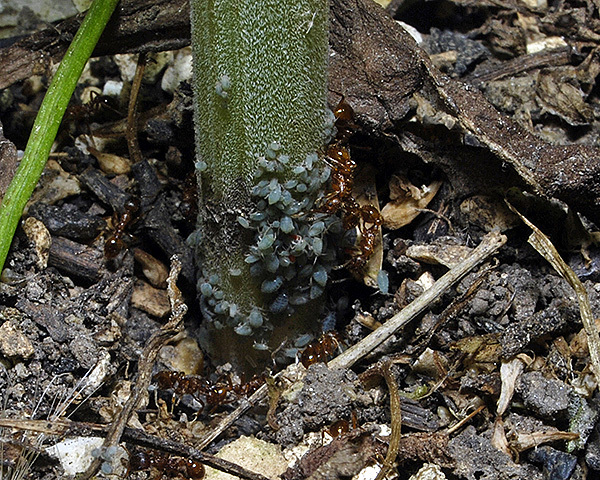 The Dysaphis colony was partly below the soil surface, with the upper part tented with soil by Myrmica ants. Dysaphis hirsutissima has been recorded from 2 Anthriscus species (Anthriscus caucalis, Anthriscus sylvestris). 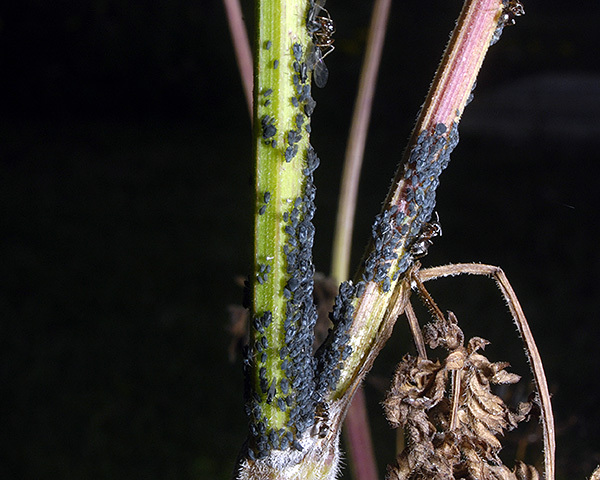 Blackman & Eastop list 20 species of aphid as feeding on cow parsley (Anthriscus sylvestris) worldwide, and provide formal identification keys. 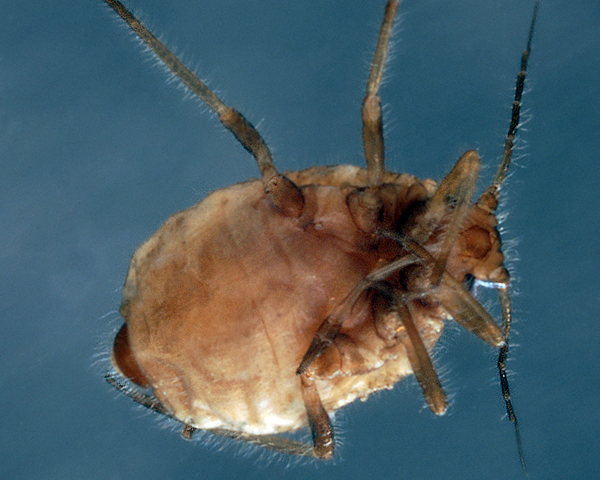 Of those aphid species, Baker (2015) lists 12 as occurring in Britain: Aphis brohmeri Aphis fabae, Aulcaorthum solani, Cavariella aegopodi, Cavariella archangelicae, Cavariella pastinacae, Dysaphis anthrisci, Dysaphis crataegi, Dysaphis hirsutissima, Hyadaphis foeniculi, Macrosiphum euphorbiae, Macrosiphum gei and Pemphigus protospirae. 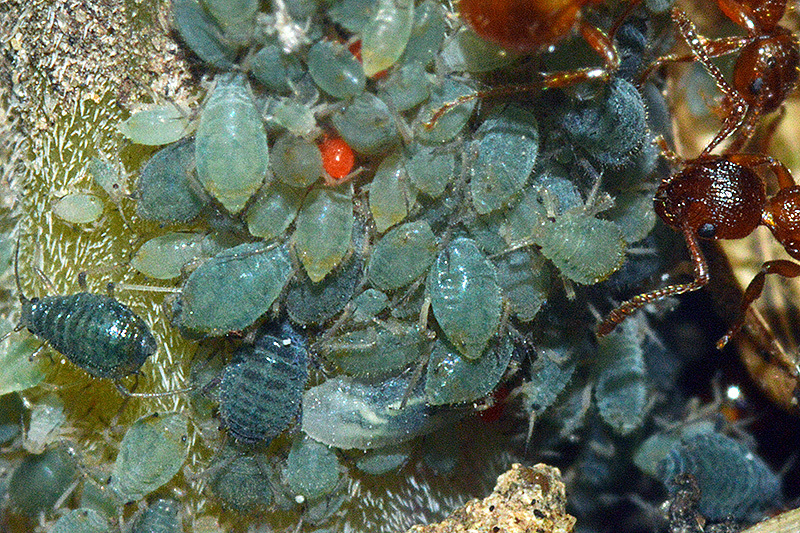 The image below shows a colony of Aphis fabae on the upper stem of the same plant as a Dysaphis hirsutissuma colony shown above.